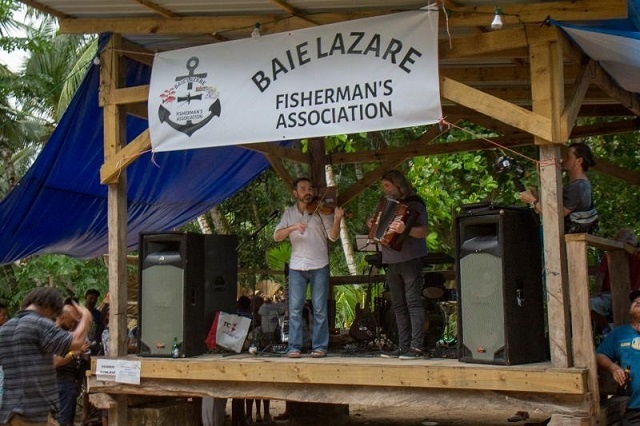 (Seychelles News Agency) - The Baie Lazare Fishermen Association in collaboration with an English duo joined forces to tell ‘Stories from the Sea' through musical compositions centred around the lives of fishermen on Sunday. ‘Stories from the Sea,’ a project of The Meraki Foundation, helped bring the Belshazzar's Feast, an English Folk music duo, to Seychelles in collaboration with the local British High Commission. The Meraki Foundation is a Seychelles-based non-governmental organisation that supports innovative artistic projects that inspire and empower Seychellois communities. The project aims at showcasing untold stories from the fishermen community using artistic mediums such as music and videography. The jam session at Anse aux Poules Bleu -- in the southern district of Baie Lazare -- was the main activity from ‘Stories from the Sea’. The duo of Belshazzar's Feast, Paul Sartin and Paul Hutchinson, have been playing folk music together for 25 years. Performing mostly at folk clubs, folk festivals and art centres in England, the two have also taken to the stage in America, Spain, Australia and Belgium. “I think that traditional folk culture is always very important in the sense of self and identity, particularly in the time of change. It is important that the traditional culture is kept alive,” said Sartin. She added that in future, the foundation wishes to expand the project to touch other districts so that a collection of the stories of different fishermen in Seychelles can be put together. The Baie Lazare Fishermen’s Association was formed in July last year. The chairperson, Jean Claude Michel, said that the aim was to create a facility for the fishermen in the district as well as bring entertainment to the area as the youth do not have much to engage themselves in. “We have submitted a project to get the finance to build a market, an ice plant as well as an area where we can process the fish. We would also like to show the youth how to build a fish trap as well as repair fishing nets,” said Michel. He added that despite financial constraints, people hailing from Baie Lazare have slowly managed to transform the area, which currently hosts a stage, bar, and area to play dominos and a big screen where people gather to watch football matches. On Wednesday the British High Commission will exhibit a series of photos and videos to showcase the work done to make the project possible.